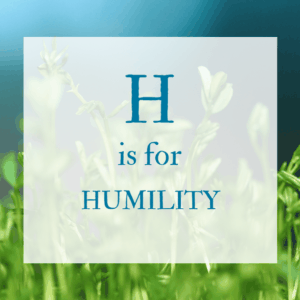 When I selected HUMILITY as my “H” in this A to Z Blog Challenge, I didn’t realize that it would coincided with Palm Sunday, the Sunday before Easter. At my church the service is full of readings, music, and images of a humble man, whose obedience leads him to His death. A behavior we’re asked to imitate in our daily lives. As I sit with my thoughts about humility, I regret that I’m attempting to write about it. I don’t even know where to begin to explain the role humility plays in Spiritual Growth, but it does play a role, an all-encompassing one. Saint Benedict probably gave us the most useful information about humility. In the seventh chapter of his famous guide for community life, “The Rule,” he says that the ascent into humility is like the movement through 12 rungs on a ladder. In his teaching, the rungs resonate with ideas like: mindfulness, submission, detachment, confession, contentment, disentanglement, and unconditional trust. This last one sticks with me. I think humility is more about trust, than anything else. Even though Christ asked that God find another solution for the issue at hand, he accepts humbly, the consequences, set in motion by the actions of selfish men. He did so with full trust that God would bring something good from it. And He did. It follows then, that as I attempt to imitate Christ’s humility, I must trust that God will bring good from my surrender. My trust in God is demonstrated by my humility. Humility by letting go of my rights. Humility by letting go of my desires. Humility by letting go of my plans. Humility by letting go of my preferences. Humility by letting go of my opinions. Humility by letting go of my demands. Humility by letting go of my expectations. As I stop insisting things go my way, I am saying to God, “I believe that you will work all things for my good.” Easy to do? No. But be encouraged, growing in humility is part of the ongoing process of Spiritual Growth. It is moving forward, step-by-step, in the trust that I will be okay, no matter what happens to me. I love this topic. So many times these days, I’m bright back to humility: I don’t know what the world wants or needs. I don’t understand why things are happening as they are. I am reminded about something my mom used to always say which was that we weren’t supposed to know. Accepting that was a quick path to humility. Really enjoying what you are doing here. I feel like you are speaking to the world of my private, spiritual experience. I love your mother’s thinking. Lewis also touches on this in the Chronicles. In the “Horse and his Boy,” Aslan retorts sharply, “Child,’ said the Lion, ‘I am telling you your story, not hers. No one is told any story but their own.” I think I have learned a lot about this disentanglement from maturing in the Anglican tradition. Historically, we’re okay with not knowing … it’s a nice place to be, to release one’s own powerlessness. I happy you are hearing what you need. God’s funny that way, bringing what we need, when we need it. Humility is a big lesson for me in my life. Always smart and ahead of my class I knew things before anyone else. Grew up thinking it would always be so. SURPRISE! After many years of depression and anger and fear, I turned to our lady, Mary and asked for her advice. I studied her life and realized she was the ultimate lesson in humility. She emptied herself of herself to accept the Son of God. Now I try to empty myself of my pride and fear and accept God’s plans for me, too. These daily lessons speak to me. Feels like I wrote some of them because the thoughts are so familiar. Thank you, Lisa, for helping me to rethink some old memories. Interesting how things change! I too have turned to Mary, as a source of example. This is very ODD for me, since I grew up as the daughter of a Southern Baptist. We didn’t talk about Mary, almost as if Jesus were born without a mother. But that isn’t true! She suffered so much, and deserves our thought and respect. This lesson in an of itself has taught me humility. Patricia, I’m so happy to know that these pieces are touching something in your memory. God is good, if we’ll let him in, to all of ourselves.